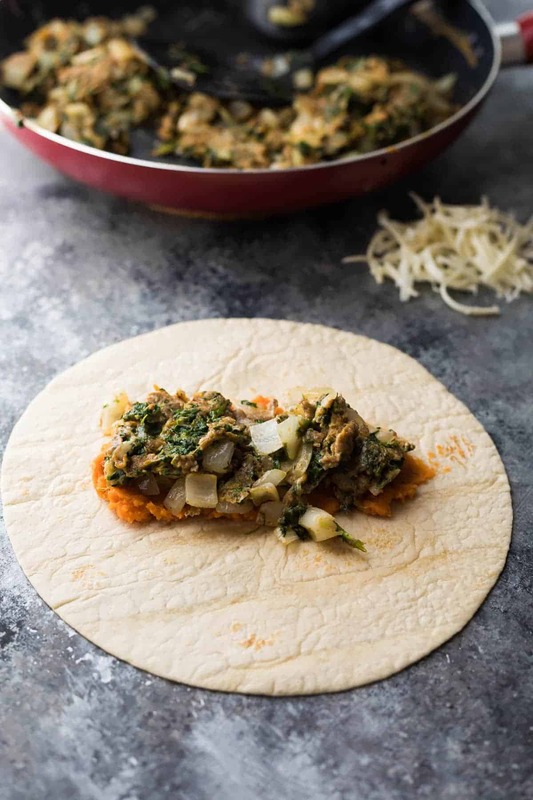 It’s been awhile since I shared a breakfast recipe with you…not since January, when I shared these Healthy Breakfast Burritos with Kale, Mushrooms & Feta. 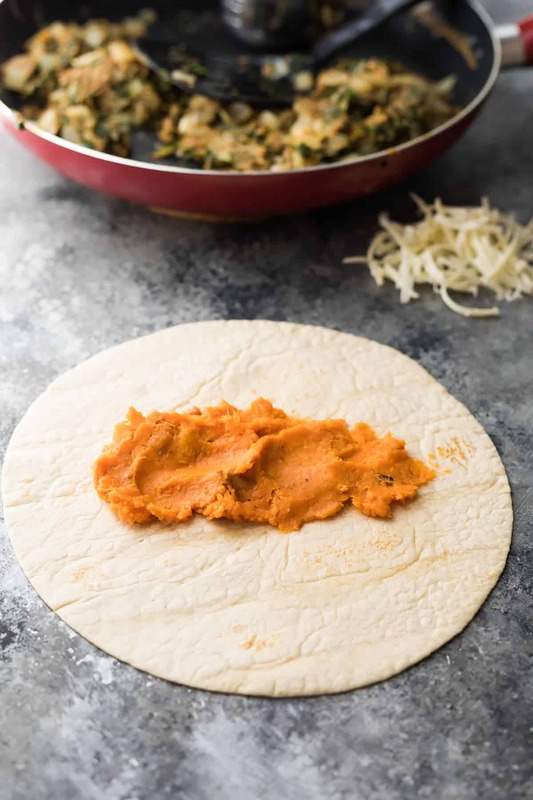 I thought it was time to share another…and here we are today with these southwestern sweet potato breakfast burritos! Breakfast burritos are one of my favorite meal prep breakfasts, because all you really have to do is cook the filling, then cool, then roll. So so simple! Not only that but they freeze amazingly well. We enjoy ours for breakfast, but also for lunches in a pinch. Such a great back up plan for those days when you don’t have anything else prepped. 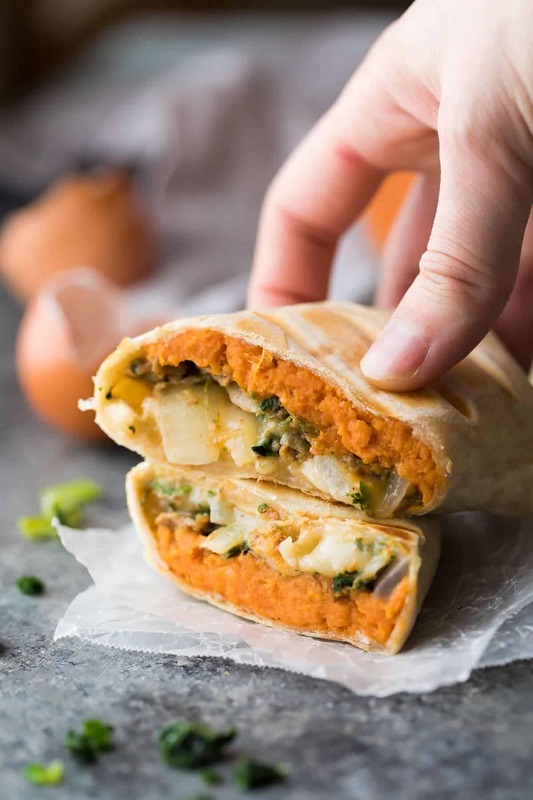 These sweet potato breakfast burritos are a tiny bit more effort than your regular breakfast burritos because you need to roast your sweet potatoes first. But really, you can just toss them in the oven, and focus on the rest of your filling. And for this ‘extra effort’, you are rewarded with some of the most delicious breakfast burritos I’ve ever tasted! 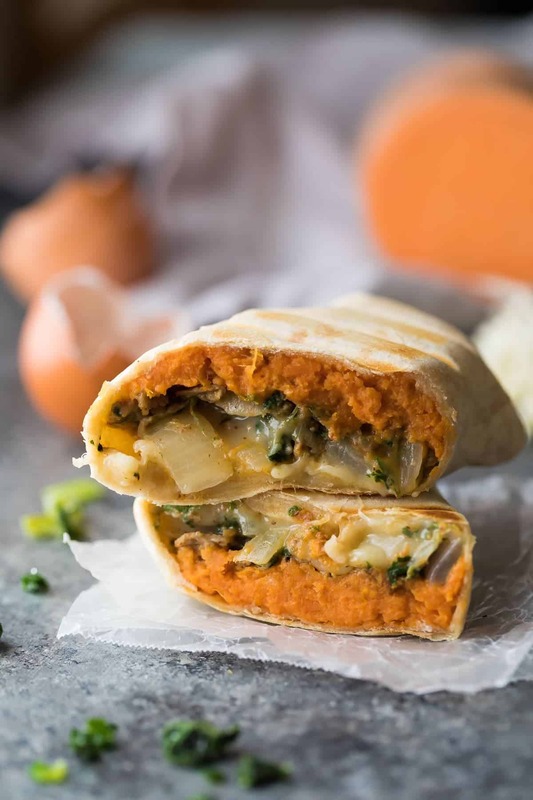 First, you spread a layer of sweet potato puree out on your tortilla, then top it with a mixture of eggs cooked with sauteed onions and spinach. The eggs have a touch of chili powder to give this recipe a bit of a southwestern flavor profile. I love that you are getting a healthy dose of veggies in your breakfast. I am always trying to sneak some extra veggies into my diet ;). Not only that, but these guys are packed full of protein and will keep you feeling full until lunch! I hate it when I get hangry at 10 am. That won’t happen with these guys! That’s it for today! I hope you add these to your meal prep routine. Let me know if you like them! Drain excess moisture from the eggs before wrapping by tilting the pan as they cool. 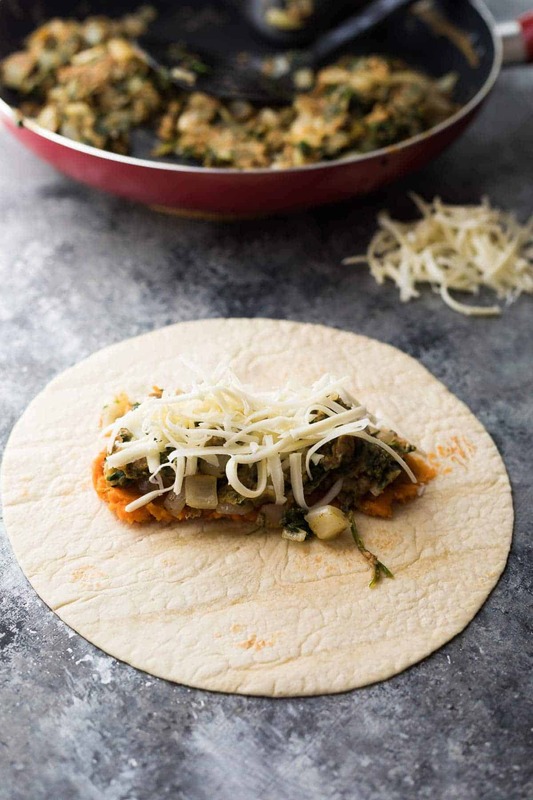 Swap this filling for these Kale & Feta Breakfast Burritos! Sweet PotatoesPre-heat oven to 425°F. Toss the sweet potato cubes in the olive oil, and spread out on a baking sheet. Roast in the oven for 25 minutes, stirring once halfway through. Remove from oven and mash in a medium bowl. Allow to cool before assembling burritos. FillingIn a large pan, heat the olive oil over medium heat. Add the onion, and sautee for 5-7 minutes, until soft and translucent. Add the spinach, and cook until wilted (1-2 minutes). While cooking veggies, whisk together the eggs with the salt, pepper and chili powder. 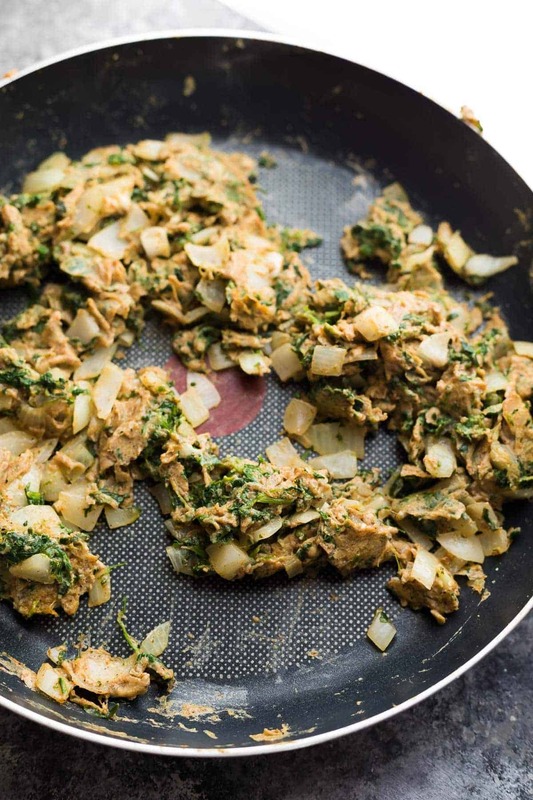 Pour evenly over the veggies in the pan, and cook, stirring frequently, until eggs are scrambled and cooked through. Remove from heat and allow to cool completely before assembling burritos. BurritosSpread ¼ cup of sweet potato puree on a large flour tortilla. Top with ½ cup of the egg mixture, and ¼ cup shredded cheese. Storage InstructionsWrap tightly in plastic wrap, then place in a storage container. To re-heatBEST: thaw in the fridge overnight. ALTERNATIVE: microwave on a paper towel in 30 second increments. TO CRISP UP: fry in a frying pan for 3-4 minutes/side, or on a George Foreman Grill for 2-3 minutes total. I consider myself an expert on (eating) breakfast burritos. As a masterpiece of food goes, this recipe is the cream of the crop! They look so delicious. Yeeeeees!! I’m a huge breakfast burrito fan and I’m always looking for new ways to make them fun! 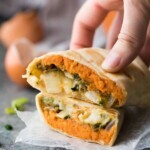 LOVE the sweet potato you packed into these winners!